Jean Philippe Charles Le Harivel was born in 1918, in Mer, central France, son of Philippe, a school teacher. 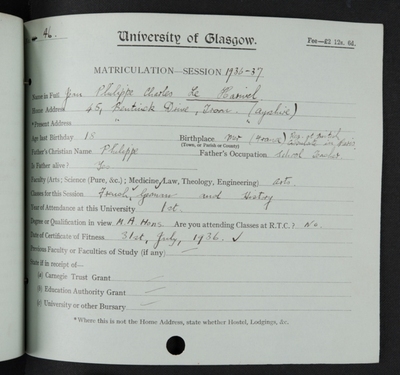 He enrolled at the University of Glasgow in 1936, and graduated MA in 1940. He took classes in French Language & Literature, German Language & Literature, Political Economy and History, and graduated with honours in French and German. During his time at the University, Jean's academic performance was recognised on several occasions; In the 1936-37 session, he was awarded a First Class and Certificate of Distinction in French Language & Literature, a First Class Certificate in Professor Herbert Smith's German Language & Literature class, as well as a Certificate in Professor Andrew Browning's History class; during the 1937-38 session, Jean was awarded a Distinction in Professor William Robert Scott's Political Economy class; and finally, in 1938-39, he won a First Class Certificate in German Junior Honours. Due to the Second World War, Le Harivel graduated in absentia. He was appointed an agent of the British Secret Service Special Operations Executive (SOE), and received training at Wanborough Manor, a country house near Guildford. Le Harivel was a radio operator for the CORSICAN mission parachuted in to action on the night of 10 October 1941 at Beleymas, near Bergerac. Along with his colleagues, he was arrested by the Vichy police, and taken to Camp Mauzac, where he escaped with ten comrades on 16 July 1942, through Spain, eventually reaching London in October 1942. In April 1943, Le Harivel returned to France assigned to the French Army. As a result of his war efforts, he was awarded the Croix de Guerre 1939-1945.